At the heart of helping people move toward lives of self-determination, connection, companionship and contribution are effective skills in person centered planning, the development of personal support networks, and strategies that define vision, invite collaboration, and build the energy and commitment necessary to work together on complex problems. PATH and Creative Facilitation is an intensive practice-based training event based on the internationally recognized work of Jack Pearpoint, Marsha Forest and John O'Brien, John McKnight, John McGee, and Joseph Schaeffer. PATH is simply the most powerful individual, team and organizational planning tool we've ever encountered. All participants leave having done their own PATH, and having co-facilitated PATHs for two other participants. They leave inspired, energized and with actual tools to start using immediately at work and personal situations. The best workshops involve diverse training groups – professionals, parents, extended family members, people who receive supports, circle members, and ideally a number of 'civilians' – people who come from other walks of life: business people, artists, architects, leaders in civic associations, church members and clergy, elected representatives, etc. PATH and the related facilitation and team-building tools are being forged in the disability field, but they have been shown to have real value in other areas including child protection, mental health and corrections. Since the tools are not 'disability-specific', they are a gift to the larger civic community as well. David and Faye Wetherow are parents, seasoned facilitators and service innovators. They created the first Microboards, inclusive housing and service cooperatives, and some of Canada's first individualized residential, employment and personal support services. "Wonderful, gentle, wise souls. I felt safe and respected. I was totally engaged the entire time, and that doesn't happen to me very often in a workshop context." "You were an integral, energizing force in my efforts to recover from chronic sadness and rage at the ways in which my son had been marginalized over the past few years." "PATH training was a multi-faceted gift -- not only did I come away more excited about a planning process than I had been in ages, but I also had the opportunity to experience a tiny slice of the renowned Wetherow magic -- and I'd been pining for that for a long time." 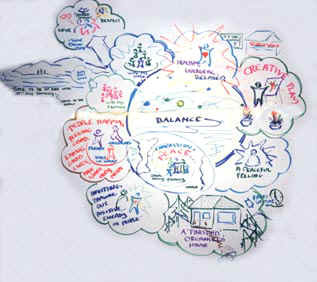 Contact us about organizing a PATH / Creative Facilitation training event in your area.